As mentioned in my previous post, I’ve been reading some wonderful mysteries this summer, so I thought I would share a review with you for a change. When Detective Inspector Louisa Townsend fills in for her boss, Police Chief Nakibae, at a Pacific conference on money laundering taking place on Fiji, she is unaware of the political coup going on. When she arrives after the imposed curfew at a deserted airport, alone except for one other passenger, she is unable to get to her hotel in Suva city centre. Luckily, two wealthy Australian businessmen happen to be passing through and offer them accommodation at their guest house. Although Louisa is suspicious, she has no choice but to accept their generous offer. Having lost her luggage in transport—a huge inconvenience to say the least for the fastidious Louisa—she carefully hand washes her underwear and leaves them to dry overnight. That way she won’t feel quite so dirty and uncomfortable the next day. But when Louisa wakes up the next morning, her underwear has been moved. Someone has been in her room! As her wallet and passport are still there, her host, Rick, doesn’t take her complaint seriously. His guest house is supposedly one of the most secure on all of Fiji, and the door was locked from the inside. But when Rick and Stewy turn up dead and a local shoeshine boy disappears, Louisa seems to be the only one who thinks there is a connection. The only problem is her jurisdiction is limited to Tarawa, and Fijian Detective Inspector Vika doesn’t want her help. Is Louisa losing her mind? DI Vika certainly thinks so when she obtains a copy of Louisa’s confidential medical record on the sly, indicating a history of obsessive-compulsive behaviour. When one of Vika’s underlings, Constable Makereta, is assigned to keep watch over Louisa by sharing her hotel room, Louisa can’t help but expect the worst. Makereta talks too much and thinks Louisa should stop swearing and be more sympathetic to the church. But worst of all is Makereta’s untidiness and lack of hygiene, going so far as to put her shoes on the bed covers. It makes Louisa’s skin crawl just thinking about all the germs Makereta has introduced into their room. Despite Louisa’s revulsion, it turns out that Makereta likes Louisa, which is fortunate as she’s Louisa’s only hope of finding the killer and leaving Fiji in time for her big trip home to Edinburgh with her Kiribati boyfriend, Mataio. They’ve been planning the trip for over six months and Louisa can’t wait to show him all the places she loves and misses. 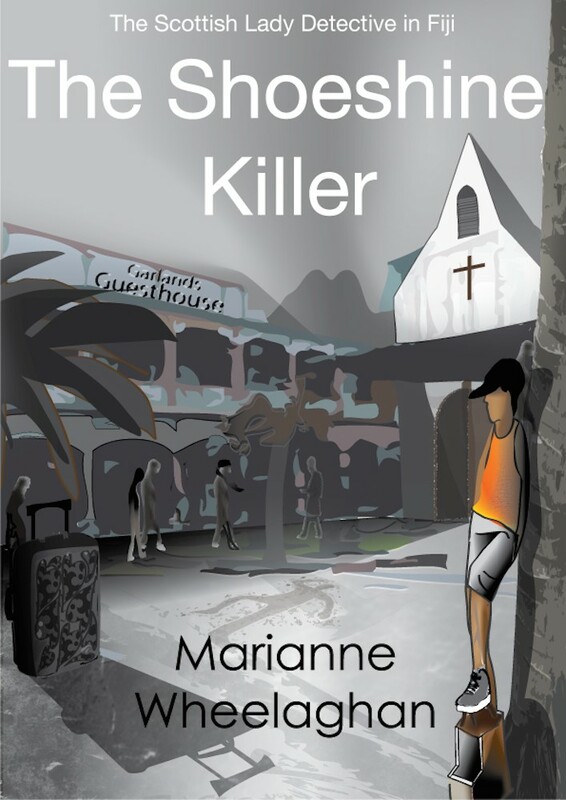 Together will Makereta and Louisa be able to outwit the Fijian drug lords and street gangs (not to mention DI Vika) in order to find the killer, before it’s too late? This mystery is more than meets the eye. Set in what is seen to be a tropical paradise by some, and a place of inescapable extreme poverty to others, Wheelaghan explores the root of what home means, in all of its duality, both for those who are born and live in their home country as well as for those who emigrate. Wheelaghan’s characters are well-rounded and true to life and she embraces the complexity of the Fijian and Kiribati cultures. Along the way, Wheelaghan does not shy away from exploring the weighty issues Louisa encounters as she searches for clues, such as poverty, the role of religion in deprived communities, and what it is to be a woman in a male dominated culture, be that culture the Pacific Islands or the British Isles. That is not to say that this short novel is a heavy read, only that it packs a punch beyond its pages. Indeed, Wheelaghan’s characters and storyline dominate at all points and although she does not shy away from bigger issues, she also resists getting bogged down by them. I very much enjoyed this novel and would highly recommend it to both mystery lovers and non-mystery lovers alike.